Most millennial women are interested in exploring the investment and insurance world, but fear taking a wrong step, thereby damaging their finances. This article will clear your doubts and guide you in the right direction. It has been almost a week since the world celebrated the 44th International Women’s Day. However, as put forward by many brands and advertisers, every single day is as much for women as it is for men. We are all for such progressive thinking; after all, women are leading positively in every arena. Here’s addressing key doubts regarding the investment and insurance world today and clearing the air. So women like you can explore and expand your financial horizons for the better. Ladies, investment is not the scary monster it is usually advertised to be. If anything, investing with a proper plan can help you create wealth, meet your financial goals much easily, and be financially independent (which, needless to say, is the need of the hour). It is true that investment markets can be volatile, especially if you are considering investing in mutual funds. However, it is no reason to worry about and chuck the idea completely. The thing to remember is that investment makes no promises or promotes any ‘get rich quick’ scheme. Instead, it is all about commitment and making responsible financial decisions. So, consider investment with a long-term commitment in mind. Most experts advise getting in the game for a minimum of 5 years to reap maximum benefits. What are your options to invest? Many millennial women choose options like FDs (Fixed Deposits) or gold, for their low-risk nature. In fact, these options are beneficial if you have small financial goals like going on a vacation, buying a new car etc. Similarly, investment in real estate is another popular investment option that could make you asset-rich, not money-rich. If your goal is to create a corpus of wealth to take care of both your short and long-term financial goals like creating wealth for old age /retirement planning, we encourage you to look into mutual funds. Although Mutual funds require some level of risk tolerance, they are statistically a beneficial investment option compared to others. This is because the money invested in mutual funds multiplies by the power of compounding. Suppose you start investing INR 5,000 monthly in ELSS mutual funds, assuming 15% annual returns, your money could grow to ~ INR 4.4 lakh in 5 years, ~ INR 13.8 lakh in 10 years, ~ INR 33.4 lakh in 15 years, and ~ INR 74.8 lakh in 20 years. In case you are afraid of taking risks, test the waters by investing small initially. 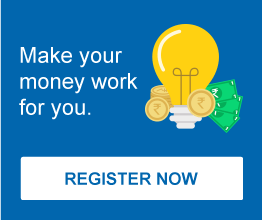 For example, you can start a monthly SIP for as low as INR 500 in ELSS mutual funds. So, whether you are a working woman, a house-wife, or a newly graduated college student, the sooner you start exploring the investment world the better. After all, there is no growth without risk. As you can start investing with any amount in your capacity, no matter how small, you can create wealth without straining your present finances or household budget. You can further redeem the profit from your funds’ returns at the end of the lock-in period and use it to pay the premium towards your life insurance and/or health insurance policy for financial safety. Why do millennial women need to take insurance seriously? We all know millennial women are all about taking life by the horns and are intricately bonded with the care-taker role. Getting insured fulfills that exact purpose. It allows you to fulfill your financial responsibilities, irrespective of the situation. Thus, freeing you from the financial dependency on your male counterpart- be it your father or husband- in times of dire need. Further, insurance policies accumulate abundant cash value over time. This is because insurance policies offer you various tax benefits while serving as a safety net for emergencies and a low-risk vehicle for long-term savings. In that sense, the premium paid towards your insurance policy is no less than an investment towards responsible wealth creation for a better and financially secure life. Further, since millennial women are currently in the prime of their life, they have plenty of time to accumulate significant savings. We strongly advise having adequate health insurance to all females as it protects you against financial helplessness in case of medical emergencies. Life is unpredictable, it is better to be prepared than to be sorry later. Today’s disruptive lifestyle has increased the susceptibility and intensity of diseases. According to a survey, millennial women undergo unusual amount of stress balancing household duties and work life. This directly affects their health; thus, putting them at a greater risk of developing lifestyles diseases and/or critical illnesses than men. After all, you can take care of others only when you are well yourself. So, make your health a priority. Our experts advise seriously looking at your lifestyle and family history and getting an appropriate health insurance policy accordingly. Suppose you have a life insurance policy for a certain time but outlive the policy period, you will receive back the sum of all the premiums paid at the end of the term. Additionally, the sum returned will be completely free of tax. Keeping this in mind, it is advisable that your male counterpart has adequate life insurance cover so you’re covered in case of an unfortunate event like his untimely death. In such an event, the lump sum payout would help secure you financially. Since insurance policies accumulate significant cash value over time, they increase your borrowing capacity. In simpler words, you can take a small loan against your insurance value in the future.